Yes, I know…I’ve been absent lately. Andrew and I are busy painting our entire house and prepping it to sell. I’ve had this blog post in my draft box for quite awhile because I haven’t had a moment to breathe with all of the painting going on at home. 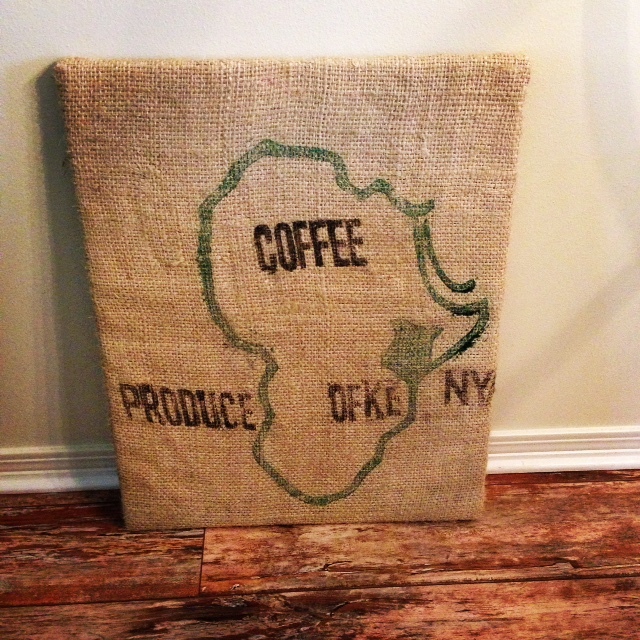 A few weekends ago I finished my art project with the burlap coffee sacks I picked up in Natchez last month. 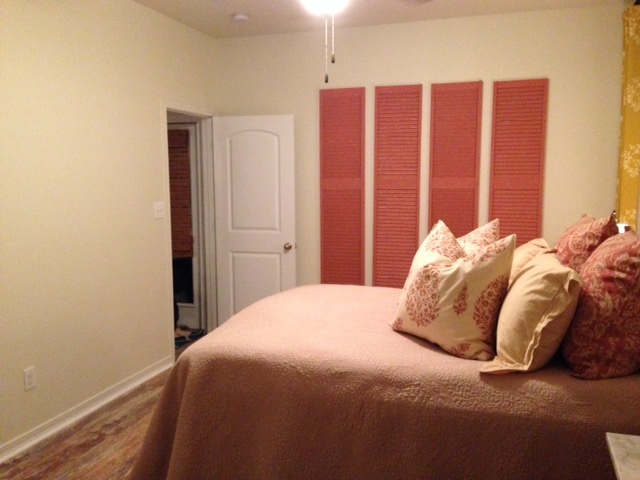 When I initially came across the burlap sacks, the wheels started turning. I knew I wanted them hung on my wall but wasn’t sure if I would frame them or stretch them over canvas. 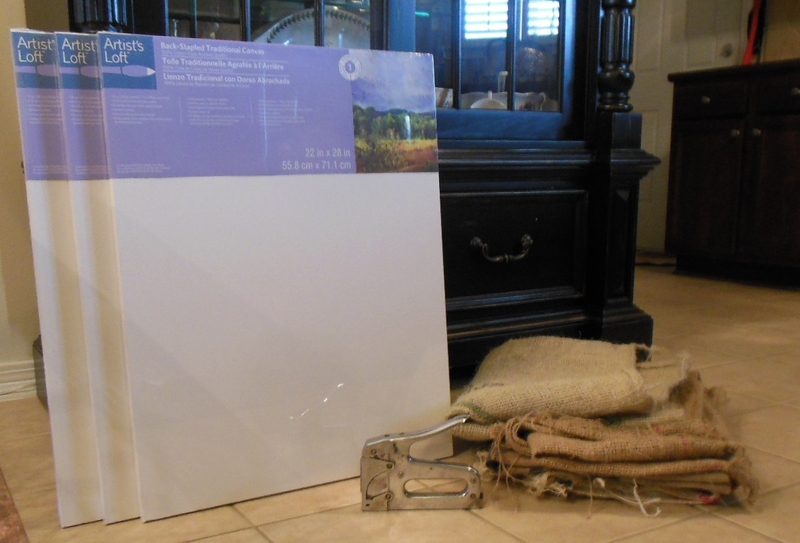 Since I envisioned them for my “creative space” (aka guest bedroom or Catherine’s craft room), I settled on canvas. 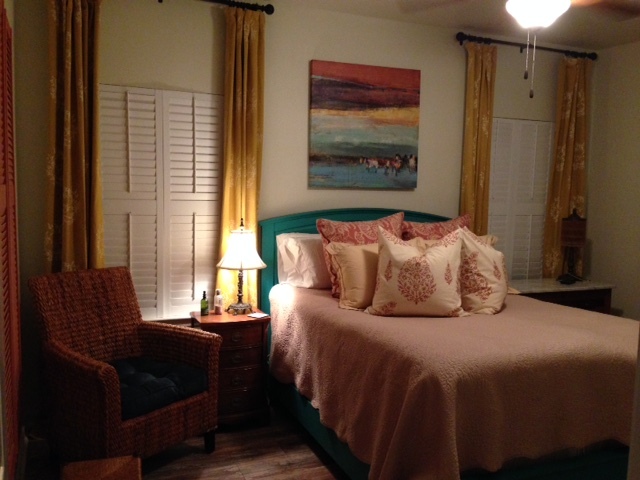 The other piece of artwork in the room is stretched over canvas as well and keeping that same style seemed the best option. I trekked over to Michael’s and was lucky enough to walk into a door buster sale and picked up three 22″x28″ canvases for only $12. That’s a steal in my book, especially since the burlap sacks were only $5 each. The hardest part of this project was cutting the portion of the sack I was stretching over the canvas. The burlap is thick and my arthritis kicked in a few times as I was cutting but I survived. 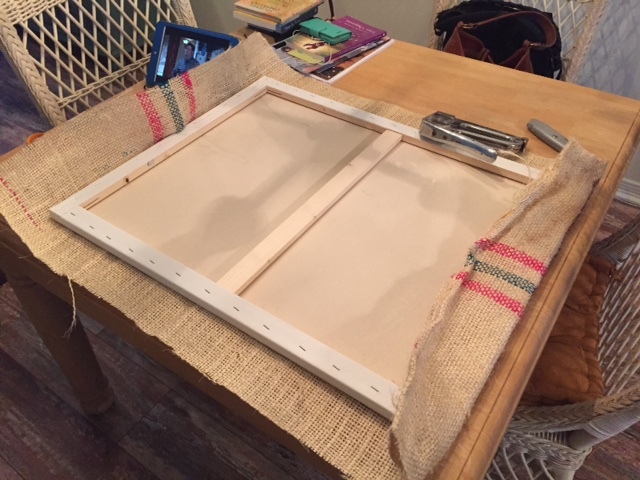 As you can see, I pulled out my husband’s staple gun and proceeded to staple the sack to the canvas. I think by the time I worked on the third sack, I got the hang of it. I anchored the middle of the top and bottom first and then worked on each side. From there, I stapled my way around the canvas, leaving the corners last. Since the corners were bulky, I trimmed the excess, folded them in and stapled. Once I completed all three, up on the wall they went. 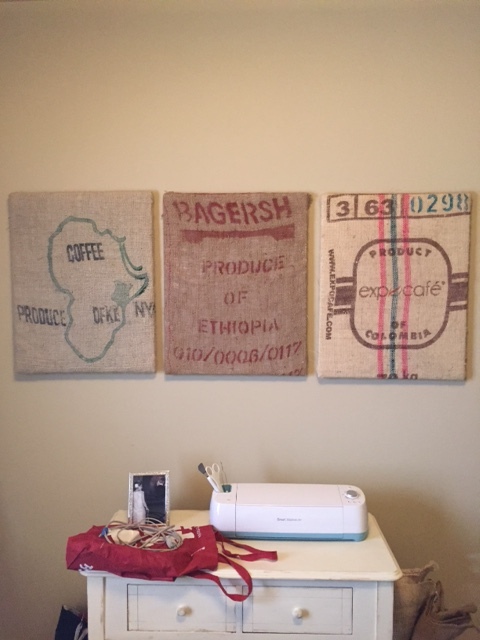 I love to see a little slice of Kenya, Ethiopia and Columbia on my walls. I’m pretty pleased with the outcome and foresee them meshing beautifully with the desk I’m eventually having made. Of course I noticed how I pulled the Columbia sack a little too snug on the left side, causing the lines to be skewed and not exactly centered. Andrew tactfully pointed that out to me when I showed him the final product. Hey, at least he is honest. I trust he will tell me his real opinion. He still thought they looked great and were a wonderful reminder of our time in Natchez and our favorite coffee shop. They aren’t perfect but maybe that’s how they are supposed to be. It doesn’t have to be perfect to be beautiful (wonderful life inspiration I picked up from The Nester). Please excuse the mess in this picture. I had just returned from the Apple store where I received the sad news my hard drive crashed. I obviously wasn’t thinking clearly because I left a mess for all of you to see. I think I’m going to space them a little farther apart but I’ll let that marinate for a bit. Don’t you think the new artwork would look beautiful over this desk? 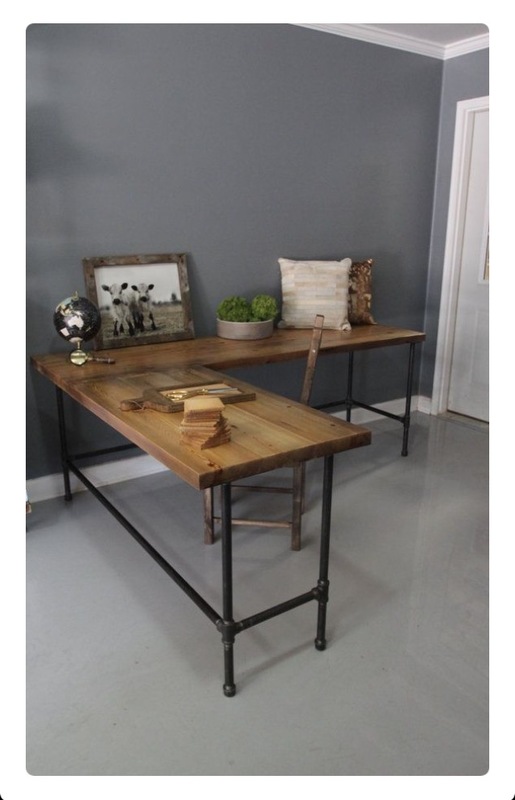 This is the piece I would love for my room one day…one day. At the start of this project, we weren’t absolutely sure if we were going to sell our precious starter home. Now that we have hopped on that roller coaster, I’m putting my room project on hold and will hopefully pick it back up in our next home. I was excited to bring this room to life and dedicate this space to my creative process but the right time will come when I will complete my vision. When that time comes, you know I will share it with you! It will be beautiful – not perfect, but beautiful. 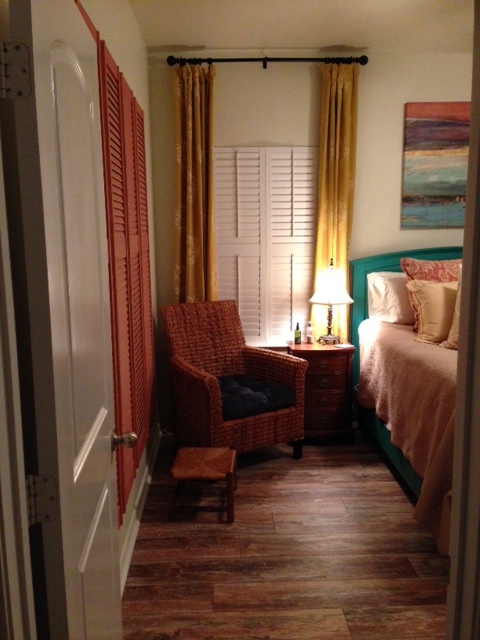 I’m in paint color love! Of course the old color wasn’t horrible but the white has given my house a much needed face lift. Everything looks better – color pops against the white wall, the lights are brighter, and I even feel better when I walk into the uplifted room. Or maybe I feel better because another room is painted and I’m that much closer to being done with the Grand Spivey Paint Project? 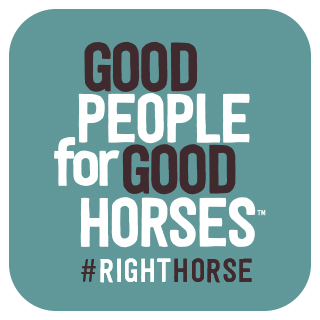 I think it’s a mixture of both. 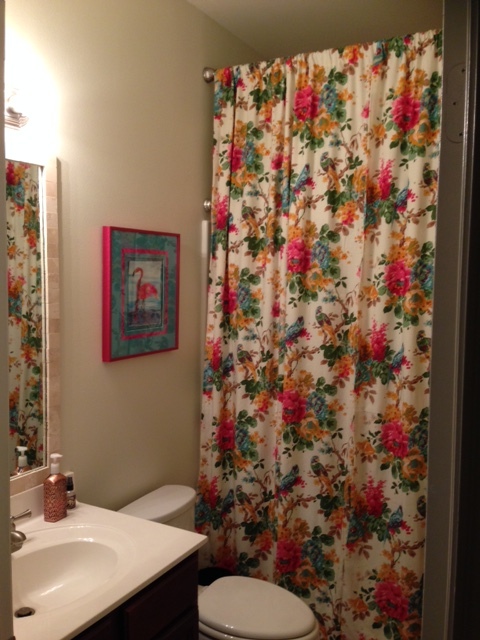 We finished the hall bathroom this past weekend too. It’s a tiny space but again, the color turned that frown upside down. My flirty flamingo loves her new home now.